Starting early on the morning of Columbus Day I set off on foot from my motel in Brooklyn to Manhattan. It was a long walk to the East River, longer than I had anticipated anyway, but as I neared the water, I had a decision to make. Should I take the Brooklyn Bridge or the Manhattan Bridge? Earlier this year, I had walked from Manhattan to Brooklyn across the Brooklyn Bridge and it was at sunset. I knew that I couldn’t duplicate those fine photographic conditions, especially on this dreary Monday morning. So, I took the Manhattan Bridge. As you can see in the photograph above, the view was not all that it could be, what with the low hanging clouds obscuring the tops of the taller lower Manhattan skyscrapers, but I did get a useable shot. 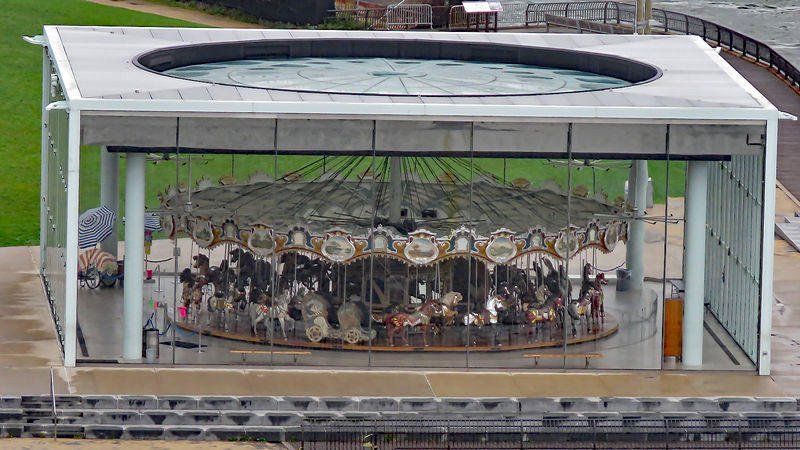 Included in that picture and the close-up below is Jane’s Carousel, a parfait in the shadow of the Brooklyn Bridge. Both bridges have pedestrian walkways. On the Brooklyn Bridge, you walk on the level above the vehicle traffic, but on the Manhattan Bridge, you walk below the vehicle lanes and more importantly on the same level as four New York Subway tracks. It was very noisy. With the morning rush there was an almost continuous din. The noise began to feel unnerving after a while. The pièce de résistance came when I had almost completed my passage. A bicycle with a siren that mimicked a police siren came up from behind me. Such was the bridge’s decibel level, I did not hear his siren until he was upon me. Anyway, I soon exited the bridge and descended into the relative quiet of lower Manhattan.